The Force is with young John Sanders. Though he may have had a reason to doubt that a few years ago. That's when John, a 17-year-old Phoenix resident (and Star Wars fanatic), learned he had a tumor in his eye. While surgeons were able to remove 75 percent of the tumor, what remained would require a different battle plan — one that relied on an "advanced radiation treatment" that doctors thought "may stop the growth of the tumor," John tells us. That advanced treatment would come through the Proton Beam Therapy Program at Mayo Clinic's Arizona campus. Like any good Jedi in training, John wanted to learn all he could about the powerful weapon that would be used to stop the tumor. So Thomas Daniels, M.D., a radiation oncologist at Mayo Clinic, gave his blessing for John to complete a job shadowing experience while going through treatment. It was all arranged through the CREST Program at Paradise Valley High School, where John is a senior. CREST (Center for Research, Engineering, Science and Technology) is an honors program that prepares students to pursue degrees in science, technology, engineering and math after high school. John's interest in science and engineering — combined with his personal interest in his treatment— made him a great fit for the program. Jedi Master (okay, mentor) Justin Gagneur, a physicist in Mayo's Radiation Oncology Department, showed John the ropes around the clinic, talked to him about the tools and math used to design the tailored treatment he was receiving, and shared how John's interest in science and engineering could translate to jobs in the medical field. John has "a scientifically questioning attitude," Gagneur tells us, and "was thoughtful, attentive and upbeat" throughout his shadowing experience. John was also upbeat on the last day of his treatment, when he proudly announced that he had "worn Star Wars clothing every day except for one" at his appointments. He was told he was a celebrity of sorts, himself, as the 100th patient to complete proton beam therapy at Mayo Clinic's Arizona campus. To celebrate the milestone, radiation therapy staff played music from Star Wars during John's final treatment. They also arranged for a meet-and-greet with a Tusken Raider, one of the fearsome desert dwellers who attacked Luke Skywalker in the original Star Wars movie. 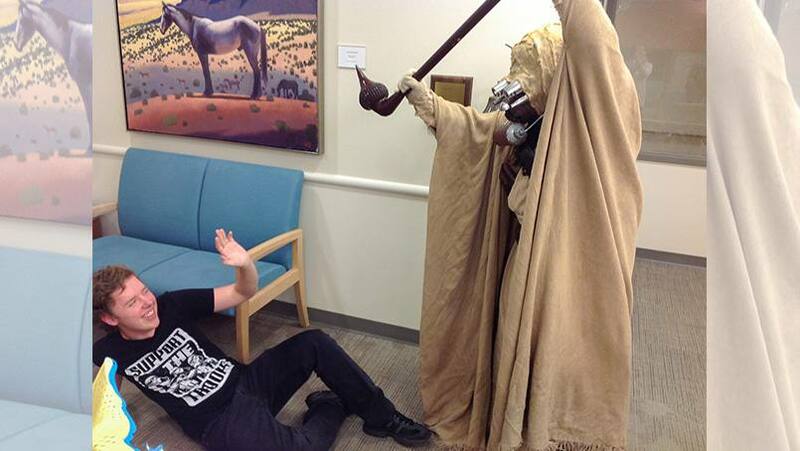 This one was played by Andrew Saunders, a radiation therapist and fellow Star Wars enthusiast, who has a collection of costumes to fit most occasions — including a bittersweet but festive farewell. You can prove the force is with us by leaving a comment below. Then you can use the handy social media tools atop this page to share this story with others. My dad died ,when I was 10, in 1972 from Hodgkin disease. I work in a radiology department in MRI. So many advances have been made since then! Such an amazing team and amazing young man.